Most of us charge up our smartphones and tablets when we sleep, but how many of us actually do so without having to plug in our device to a nearby power outlet, where most of the time, these power outlets would be located somewhere near the bed? Vodafone has something up their sleeves which could very well change the way we juice up our devices, and that is by doing so while you snooze the day away. At the recent Isle of Wight festival, Vodafone’s presence is clearly felt, the least of those being their ever present Recharge-Trucks that carry enough juice to power up to 2,000 phones simultaneously. This time around, the folks at Vodafone want to do better by offering wearable technology that can power up your peripherals and gizmos, relying on nothing else other than your body heat and movement. 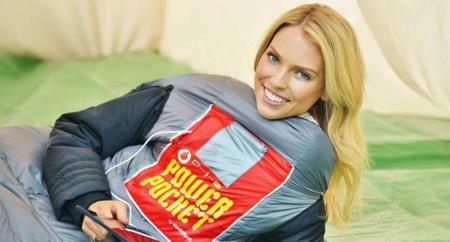 The Power Pocket is a device that has been incorporated into a pair of Power shorts as well as the Recharge sleeping bag, where both of these have been joint developed with the Electronics and Computer Science Department at the University of Southampton. The Isle of Wight festival is a good place to use these as a trial run, and basically to charge up your smartphone while you sleep requires technological wizardry, and not magic. Basically, in the Recharge sleeping bag, as your body dissipates heat on the inside layer, there will obviously be a difference between that temperature and the colder one on the outside, and thanks to the Seebeck effect, this is where the power is generated. If one were to take the Power Pocket shorts into consideration, it is touted that an entire days’ worth of walking and dancing in the Power Pocket shorts will allow one to juice up a smartphone for four hours, not too shabby, eh?